Not too far from where I live, tragedy struck Wednesday morning. Six people were shot while out doing everyday errands at a car wash and barbershop, by a man who went on a shooting spree in Herkimer, NY. Four were pronounced dead. As Wednesday evening settled in, the shooter had hidden himself inside a vacant building and the FBI had him surrounded. Early on Thursday morning, news came that the shooter (I prefer not to call him by name) had been killed, but not before something else tragic happened. Ape, the K9 there on duty that morning, serving his people and doing exactly what he had been trained to do, was fatally shot and killed by the shooter when he was sent inside the building. Ape had only been on active duty since the end of February and was two years old. Of course I have questions...Was he wearing a vest? Why couldn't gas have been thrown in instead of this precious dog? Right now I am trying to keep the "what ifs" at bay, and just focus on how grateful I am for dogs like Ape. RIP, Ape. You make us proud. We read dat in da news bouts Ape and it is heartbreakin' anudder K9 has to be buried...but a hero he was. We is always left withs questions when we hear things like dis. We heard about this on the News last night.. we were very sorry fur everyone. We did NOT realize it was so close to where you live. We just do not know what is going on with all of these crazy people. The Rainbow Bridge now has One more Hero. I'm so sorry to hear that!!! He is indeed a hero!!! A perfect example of how canines are invaluable companions! We give Ape a big Old Aroooooooo for being such a hero, and we sure will visit him we we go to the Bridge, bet all of them there now are given him a big PAWTY! Thank You Ape!!!! We're with Susie and Bites....AArrroooooooo for Ape, what a hero. We like not naming people who do horrendous things....don't make them famous. We heard this horrible story on the news downstate. I am so appreciative of dogs like Ape. Such a tragedy. Mom saw the news about Ape in our paper. So sad, but he was a real hero. But so young. I agree with Murray that something else could have been used. Seems wrong to send a dog to certain death, into a building with a shooter. But maybe we are wrong about that. Just don't know, but my heart breaks everytime I see one of these things happen. That is terrible. Poor Ape, such a short career. Also questions...a vest or gas or some other option to try first. RIP APE. We are sure you will have lots of friends over the bridge. RIP, beautiful Ape! Now you'll be guarding the gates of Heaven. News like this always makes us very nervous as well. Our son in Michigan is a K-9 handler and officer. 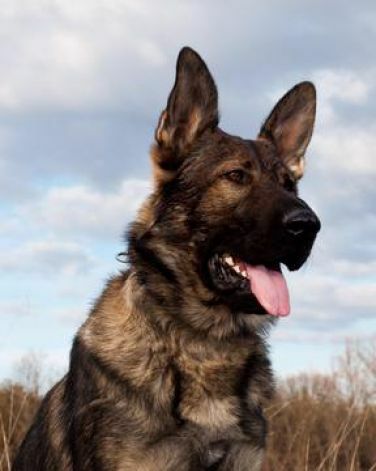 His partner is "Chase" a beautiful German Shepherd who is very loving and protective of his family but as a K-9 police officer, he has captured many of the "bad guys" and has received many citations for his bravery. A sad story all the way around. RIP Ape, you died a Hero. Just terribly sad for all. RIP Ape we wish you a speedy journey over to the rainbow bridge where you can run free. You are a hero! Poor Ape, I don't think it takes a genius to work out that some maniac with a gun is going to kill a dog sent in to get him. Rest in peace beautiful boy, what a tragic story. Oh, I heard this on the news, and just broke my heart. Ape was a true hero indeed. Expressing sorrow for all those who lost their life in this tragedy including Ape. Thank you for sharing the news of this hero. He did his job to protect his people and all those around him. Ape is a hero to us all. Humans can be so so so sick. Just stopped to meet y'all and follow. Poor Ape. What a brave doggie at only two years old. May he rest in peace. You have to wonder what his handler was thinking sending him in to face an armed lunatic. I hadn't heard of this tragedy. Another sad day. My condolences to the families/friends involved. Stop and visit me tomorrow! I have an Award for you!